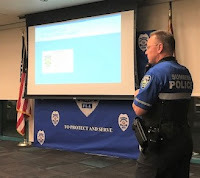 Eugene Flinn - South Dade Updates: EBC Advocacy Team participated in Sunrise Police Department Bike Summit with the heads of South Florida cycling clubs, including Cycling Family Broward, teams and groups to come up with real solutions for bike safety. EBC Advocacy Team participated in Sunrise Police Department Bike Summit with the heads of South Florida cycling clubs, including Cycling Family Broward, teams and groups to come up with real solutions for bike safety. I am pleased to be part of the EBC (Everglades Bike Club) Advocacy Team working for public safety. Sue Kawalerski, Peter Gorshi, MD, and I attended the Summit representing the EBC Advocacy Team at a City of Sunrise Bike Summit on January 29, 2019. The EBC was invited to attend to participate as part of an ongoing effort by the Sunrise Police Department with the heads of South Florida cycling clubs, including Michael Gale, Publisher of Cycling Quarterly, Cycling Family Broward, cycling teams and groups to come up with real solutions for bike safety. The City of Sunrise was represented by Mayor Michael J. Ryan, also an avid cyclist. Nick Sortal, triathlete and member of the Plantation City Council also participated. The Sunrise Police participated in full force starting with their Chief, Anthony W. Rosa, and many of the police leadership team. The Sunrise presentation was spearheaded by Ofc Allen Stotler (pictured, left). Members of the Sunrise City Engineers and Sunrise departments participated. This was not a "photo Op". This is a part of an ongoing coordinated effort to improve the safety of our road ways. Complete Streets are part of improved safety. Sunrise Mayor Ryan was proud to point out that The City of Sunrise is nominated in two categories for award for two of its bike lanes projects at The Safe Streets Summit to be held in late February in Miami. I did point out that Palmetto Bay has also been recognized for its Safe Streets work to date as Palmetto Bay is also a nominee in the Miami-Dade County section for the Complete Streets Community Award. Prior related posts on Bike Safety - CLICK HERE. Prior related posts on Distracted Driving - CLICK HERE. Efforts are ongoing in Miami-Dade County. While Mayor, it was my privilege to represent Palmetto Bay in meetings of County Commissioner Daniella Levine Cava's "Dead Serious" campaign, a collaborative effort that has included residents and officials throughout District 8, Pinecrest, Cutler Bay and Palmetto Bay, as well as representatives of Miami-Dade County, district 8. Miami-Dade County Parks, TPO, Bike 305, Everglades Bike Club (EBC), FDOT, Police and University of Miami. I will keep everyone up to date on the efforts to improve the safety of our roads, local, statewide as well as nationally; to create a peaceful co-existence for all: motorists, cyclists, pedestrians. Remember – students, our children, the youngest of our community are all involved in commuting to school through all three methods of traffic. Drive safe. We aware. Don't text and drive.